How about a holiday on a 200 year old estate in the southwest of the 'Green Island'? Self-catering or half-board in a comfortably furnished 2-6 person apartment on the fish-rich Lough Allua in unspoiled nature. Tirna Spideoga-the land of robins, lies between the villages of Inchigeelagh and Ballingeary, in one of the few Irish-cultural enclaves of the island. The cottage is nestled in a huge natural park. Its location provides a starting point for interesting tours, and nearby is the Gougane Barra National Park. A trip is also worth the harbor town of Bantry, the flower island 'Garinish Island' and Glengariff. This village is the starting point for a round trip on the Beara peninsula over the Healy Pass. Time should also be taken for the most famous route, the Ring of Kerry. If you do not just want to spend your holidays in the car, there is a diverse program. Ireland, the land of anglers and canoeists: The approximately 10km long Lough Allua, the lake in our area, offers trout, pike, perch, Friedfische etc. Our fishing boats, on request also with engine, as well as fishing shop and smoke house, are always at your disposal. Licenses are not required here. We also organize weekly deep-sea fishing tours for up to 30 different fish species, such as: B Congeraale, cod, pollack, coalfish, ling, wrasse, etc., but also different shark species such. B. the blue shark. Rods and fishing gear are included in the price for sea fishing, which is around 40 to 50 € for a day trip. You can explore the Lough Allua and the River Lee in our one and two two-seat canoes, the daily rent is € 15, - per person incl. Pick up and drop off service. Riders, hikers, nature lovers u. Cyclists: The 'Green Island' is characterized by a unique flora and fauna for Europe. If you want to explore these unique landscapes on your own, you can do so with the available tours or mountain bikes. The daily rent is € 7, -. Here almost every street is a bike path with very little traffic, behind every bend a new panorama awaits. Ireland, the land for culture hungry. This country offers a lot of program for hikers, mountaineers, surfers, golfers, etc. We will provide you with an experienced and qualified hiking guide who will guide you through the history and geography of the surrounding area on organized hikes. You may also want to explore the area from the back of our horses. A riding instructor gives lessons in the riding arena behind the house and for experienced riders, of course, rides are also possible. Riding helmets and boots in all sizes can be provided. Guinness and Irish Folk: The pubs of Inchigeelagh and Ballingeary invite you for a leisurely sing along. Not far away is the highest pub in Ireland -Top of Coom-. Here as well as at the award-winning Mills Inn, the instruments are unpacked on Thursdays and weekends. Visit the world famous Jameson Distille in Midleton, where you can join a guided tour and hearty 'Whiskey Testing'. 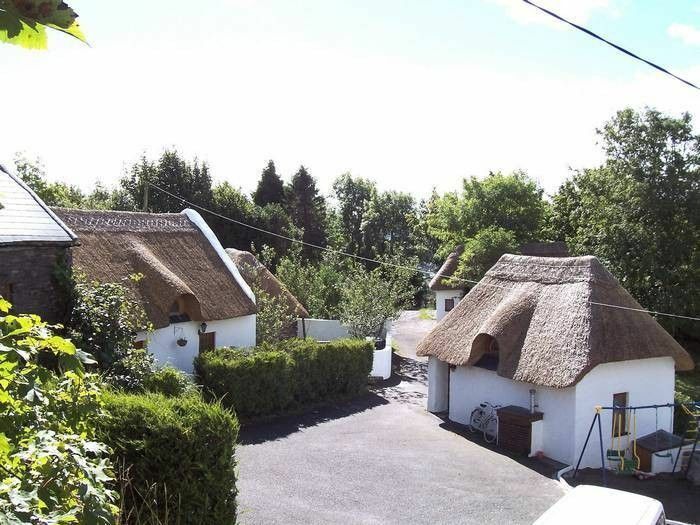 Whether you are looking for the tranquility and seclusion of our former horse farm in a thatched cottage, plan a fishing rod, horseback riding or just want to unwind, cook or pamper yourself: The favored by the Gulf Stream West Cork and the landscape Warm and open residents will not forget you so quickly. Our unit was clean, plenty of hot water and though I thought the beds would be hard when I first saw them, they were actually quite comfortable. Check in/out was easy and I would definitely recommend it if you are looking for something out off the beaten path. We had an unforgettable moment with Siggi and her friendly horses, in stunning sceneries! Definitely recommended! Samen met mijn zoon (13) zijn we 5 dagen te gast geweest bij Greg en zijn vrouw Sigi, Naast de fantastische vismogelijkheden zijn het ook enorm gastvrije en vriendelijke mensen. Greg is een Visgids met een hoofdletter V en zijn vrouw Kookt met een grote K. Na een dag zeevissen heeft zij onze vangst op een heerlijke wijze klaargemaakt. Ons eerste bezoek aan Ierland zal zeker een vervolg krijgen. Ook als u geen visser bent is de karakteristieke locatie prima in orde om op diverse manieren de omgeving te verkennen. Aufenthalt war 4 Nächte. Sehr guter Ausgangspunkt für Unternehmungen. Sehr ruhige Umgebung. Ausstattung ist OK für mich gewesen. Sehr nette Gastgeber. Komme gerne wieder. The thatched cottage sits above the lake, Lough Allua, between the villages of Inchigeelagh and Ballingeary. This is a perfect base from which to explore the southwest of the 'Green Island'. The Gougane Barra National Park is 11km away, while the Ring of Kerry, Dingle, Beara Peninsula, Mizen and Ships Head all in max. 1 car. can be reached. On nearby Lough Allua, we also rent rowboats on request with motor, as well as canoes, with which you can also paddle down the River Lee. We also organize deep-sea fishing trips, whale and dolphin boat trips, rent out bicycles, and offer rides and riding lessons on our own horses with a riding arena just behind the property. In our kl. Angelshop you can borrow fishing tackle or buy, also is a smokehouse and filleting available. Guided tours for all types of fishing can be organized, licenses are usually not necessary. Golf: Approx. 10 different golf courses within a 60km radius of the lodge. Der Preis ist ueber das ganze Jahr gleich . 4Personen Appartment € 60,- pro Nacht / €420,- die Woche. Zuschlag von € 10,- pro Appartment/Nacht fuer Aufenthalte von lediglich 1 oder 2 Naechten . Es ist zunaechst eine Anzahlung von50% der Mietsumme zu begleichen. Die Restmiete wird 60 Tage vor Mietantritt faellig . Die Bezahlung kann per Ueberweisung erfolgen . Andere Zahlungswege per Absprache. Die Endreinigungsgebuehr von € 30,- ist mit der Miete zu ueberweisen . Wir schicken Ihnen auf Wunsch gerne gratis unsere Info CD-R und Prospekte zu . Die CD-R erhaelt eine Menge Informationen , Fotos , Karten und ein Angelvideo (ca.6 Minuten) . Die Zusendung ist vollkommen unverbindlich und wir benoetigen hierzu eine Anschrift .